When an individual has problems with their iPhone, there are a number of different things that they can do to reset or restore iPhone with/without iTunes. One of which involves restore the phone to factory resettings condition so that makes it go back to its out of box newness that has not been touched. On the other hand, if an individual is not really experiencing problems with its usage, but wants to transfer ownership from one person to another, they will need to follow a process that wipes out everything completely so that their personal data and other information cannot be accessed or used again. Also, the new owner does not have to be concerned about mixing their new additions with old data that comes from the previous user. Either way, the iPhone can be restored do that it is a clean transfer to the new owner of the iPhone device. In summary, with the restore process, the new owner will receive their iPhone device with no information on it. In fact, the goal or objective is to transfer the iPhone clean with only the original operating system and firmware. And using an iTunes backup to restore iPhone is a good choice. Typically, before getting started, it is important that the user completes a back-up process to make sure their iTunes files will not be loss. The user will need to decide which type of back up process that they intend to use since it can be backed up to the cloud or their local computer. Once this backup process is complete, the iPhone can be connected to the computer via a USB cable. While the iPhone appears in iTunes, the user should click on the Summary panel in order to initiate the restore process. Using iTunes to restore an iPhone has some inherent problems that the user should be aware of before starting this kind of problem. Some of which involve receiving errors and alerts that will need to be fixed before completing the process. These problems may be due to the version of itunes used since later versions may be available. Therefore, it is very important that the user knows what to expect in advance and where they will need to go online to find solutions to the issues that they encounter. Because of all of the inherent problems experienced with these types of transfers, the users can benefit from other options that makes it easier to restore. One of the more beneficial involves the use of Coolmuster iOS Data Rescuer. #1 - Run the software provided on the computer and then connect the USB cable from the iPhone to the computer. 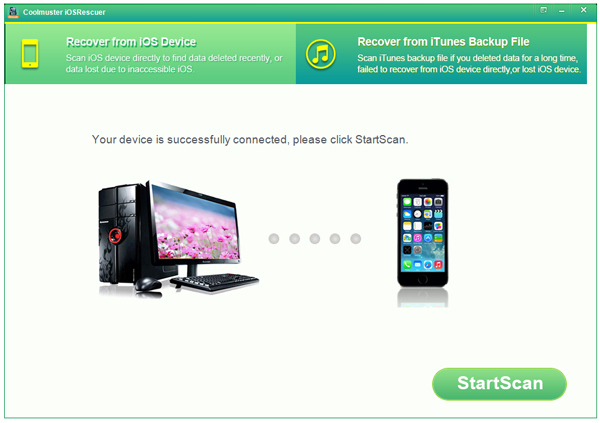 Then you will see the below interface, choose the Recover from iOS Device to continue the process. #2 - Scan the iPhone device for lost data. You can then enter the right file tab to preview more detailed information. While previewing, select the wanted files by ticking them out. Finally, hit the Recover option to restore iPhone without iTunes. #3 - On the promo dialogue, hit the OK option to confirm your action. Then wait patiently for the process to get completed within a little while.